Much like nearly all foods, beer is perishable and will go bad. Oxygen, being the bringer of life, is typically the cause for spoilage. Beers that have succumbed to oxidation will often taste like wet cardboard. Sounds harsh, but it’s the honest truth. Sure there are factors involved in this, like exactly how high the temperature is and how long you keep it there, but it is better to be safe than sorry. Also important: Whatever the temperature is that you are storing your beer at, should remain constant with no drastic or prolonged fluctuations. Despite the strong, bitter bite that hops give beers, their flavor diminishes extremely quick. A rule that I’ve heard thrown around is that about half of the original IBUs will be lost in 6 months. To truly appreciate the rich, bouquet of aroma and flavor in an IPA, it is best to drink it as soon as possible. Most people recommend you never age an IPA for this reason. Stone Brewing Company, on the other hand, have been aging their IPAs in bourbon or wine barrels. The difference here however, is that the hop flavors are being replaced by the flavors of the barrel. Another fun fact about hops: sunlight turns them into skunk spray. Literally, at the chemical level sunlight converts hop compounds into essentially the same compound as skunk spray. This is why beer bottles are brown and why you should always store beer in a dark place, especially when aging. As previously mentioned, hops fade. Something light, like a pale ale or most IPAs, are typically rather dry and have little to no residual sugar. If you take the hops away, there is very little flavor left. Contrast that to a well made barley wine or imperial stout. These have very rich and complex malt flavors. Often these are paired with an equally robust level of hops. Once the hops fade in these beers, you will begin to taste even more complexities in the malt that was previously being shadowed by the bite from the hops. Not only that, but those sherry like flavors we talked about will blend in and compliment the beer better when it is sweet and malty. However, the sweetness from the residual sugars will also start to slowly fade over time. Ultimately, all the intense flavors in a beer will mellow out and start to blend together to create a smoother profile in the beer. Similar to the above paragraph on malt, a higher alcohol content gives a more complex flavor profile that will not only preserve the beer, but also change it over time. 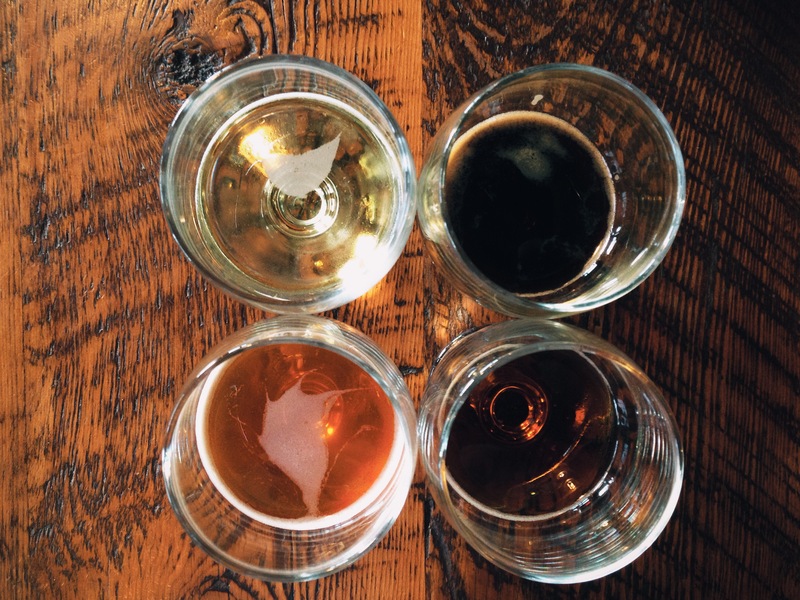 Most consider 8% alcohol as the low end for aging beers. Most high alcohol beers have higher levels of fusel alcohols. These are the alcohols that cause the hot sensations or warm feelings in some beers and many wines. These fusel alcohols will fade over time and lessen the heat in a beer, allowing you to better taste the other elements. Sure the idea of revealing the hidden flavors in a barley wine sounds like fun by aging the bitterness and some of the sweetness out, but in many cases, the bitterness and sweetness were there for a reason. Aging might make the beer worse. It will definitely make the beer different, which is ultimately the goal. Aging should hopefully give you the opportunity to experience and appreciate a familiar beer in a new light. Damn near every beer on the market gets the yeast filtered out and has carbon dioxide force injected into it for carbonation. Bottle conditioned beers are beers that get extra sugar added at bottling time. The yeast in the beer consume this sugar to naturally create carbonation in the bottle. Because bottle conditioned beer has live yeast inside still fermenting away, these beers are ideal for aging. The yeast will continue to consume residual sugars over time, changing the taste of the beer. Off flavors are also more likely to be consumed by the living yeast as well. Beers that are bottle conditioned are typically marked as such on the bottle. Keep in mind though the other points in this article. Just because a beer isn’t bottle conditioned doesn’t mean it isn’t ideal for aging. If it has a complex taste from the alcohol levels and residual sugars in the malt, aging may still be ideal. An exception to most of the above are sour beers, like lambics, guezes, Flanders ales, etc. These beers many times have relatively low alcohol levels, and very simple, clean malt flavors. The difference with these beers is that in a sense, these beers are already spoiled. However the wild bacteria that causes these beers to sour also protects them from other forms of spoilage. Even if it has a lower alcohol level, the acid level keeps the beer from unintended spoilage. Even though they may be dry with very little maltiness, the sourness doesn’t fade, and continually keeps the beer flavorful. These beers are a bit more difficult to plan on how aging will affect them. Some will tone down the sourness, blending it in with other fruit like flavors. Others, will become increasingly more sour. Each beer is different. A lot of beers are being bottled and released that have been aged for some time already. While aging a beer in a spirits barrel will contribute some intense flavors, it is important to know that once the beer is out of the barrel and in a bottle, these flavors are no less susceptible to fading out over time. For instance: I purchased a bottle of Stone Old Guardian Barley Wine aged in bourbon barrels a few years ago. Old Guardian is an intensely flavored beer when fresh, and when aged a year, it is very well balanced but still incredibly flavorful. Spending 18 months in a bourbon barrel will amplify the flavor profile of any beer, adding in flavors of charred wood, vanilla, or even coconut. With this bottle however, I didn’t get around to drinking it for about two years. At this point the beer was somewhere between 3 and 4 years old, and had been bottled and out of a barrel for a few years. Surprisingly, the beer was very mellow, and did not in any way resemble bourbon in the slightest. It was still a good beer, but all the characteristics of the barrel that were added in had been aged out of the beer entirely. It was now no different tasting than any other barley wine that had been aged for several years. Now the biggest question: How long should beers be aged? All beers are different and there is no one size fits all answer. Some beers will reach a peak, then slowly get worse after that. Some beers will reach a peak, slowly get worse, but then bounce back after some time and get better. Many experts on aging beer fully admit that often times they open a beer that they’ve been aging, and it’s now spoiled. The brewers and beer connoisseurs of the world will tell you to buy a case of a particular beer. First, drink one immediately to taste it fresh, then open another bottle every 2-4 months. Once you think it is at it’s best, drink the rest. If you waited too long and it’s gone south, wait another few months and open a new one to see if it bounces back. My advice is simpler: Drink when you’re thirsty or have guests over. Aging beers is fun but beer is meant to be drank and shared with friends. If you can save it longer, sure save it. If it sounds like exactly the beer you feel like drinking, open it up. Life is too short to not drink good beer!